Tough time to be a Chipotle lover. Chipotle’s week is off to a rough start. Its stock slipped as much as 8% on Monday (Dec. 7) as the fast-casual restaurant chain continued to grapple with an E. coli outbreak that has sickened 52 people in nine states and late on Friday led the company to project its first same-store sales decline since going public. “Sales trends during the quarter so far have been extremely volatile,” Chipotle said in a securities filing on Friday. How long could sales be hurt? 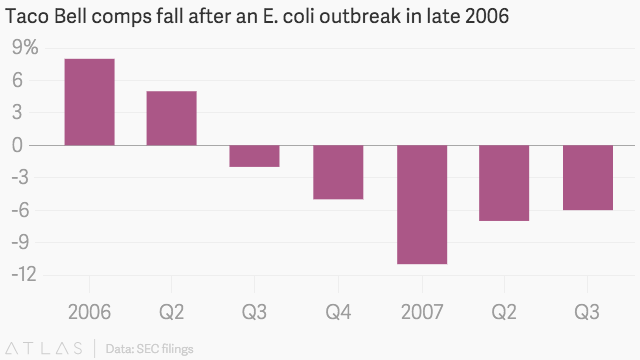 The last major quick-service restaurant to face an E. coli outbreak was Taco Bell in late 2006. The Centers for Disease Control and Prevention first identified that outbreak in November; by mid-December the CDC was reporting that 71 people had been affected in five states, and that ”shredded lettuce consumed at Taco Bell restaurants in the northeastern United States” was the most likely culprit. Should Chipotle’s E. coli outbreak play out similarly, the company could be looking at much more than a single quarter of negative same-store sales. In the days after it closed 43 restaurants in the Pacific Northwest at the end of October, as well as immediately after the CDC announced new E. coli cases in late November, Chipotle says same-store sales tumbled roughly 20%. For all of November—effectively since health officials first said they were investigating E. coli cases linked to Chipotle’s restaurants—sales are down 16%, and Chipotle’s stock is off 15%. On the other hand, Darren Tristano, president of food and restaurant consulting firm Technomic, says consumers are generally “very forgiving” and stock prices “not affected longer term” by E. coli outbreaks. Though after years of positive comps, even a single quarter of downturn might feel too long for Chipotle.